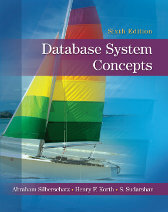 We provide solutions to the Practice Exercises of the Sixth Edition of Database System Concepts , by Silberschatz, Korth and Sudarshan. These practice exercises are different from the exercises provided in the text. (Solutions to the exercises in the text are available only to instructors.) Students are encouraged to solve the practice exercises on their own, and later use the solutions to check their own solutions. The material below are copyright by Silberschatz, Korth and Sudarshan 2010. Use of the material is authorized for personal use, and for use in conjunction with a course for which Database System Concepts is the prescribed text. Any use that differs from the above, and any for profit sale of the manual (in any form) requires the consent of the copyright owners; contact Avi Silberschatz (avi@cs.yale.edu) to obtain the copyright owners consent.